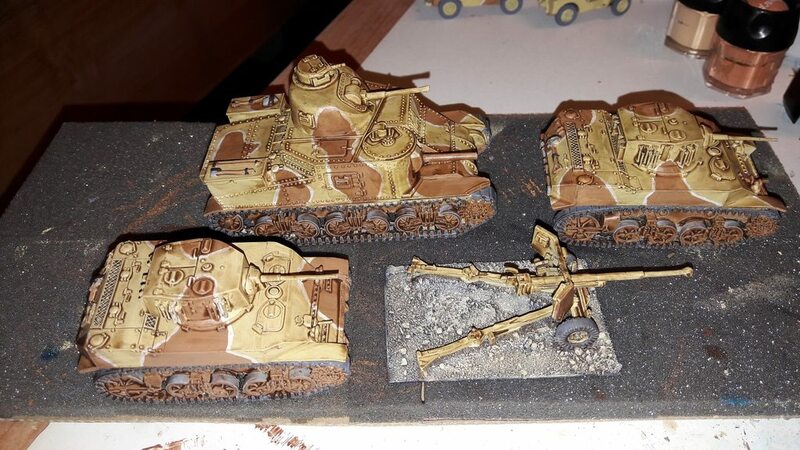 I started recently with playing Bolt Action. 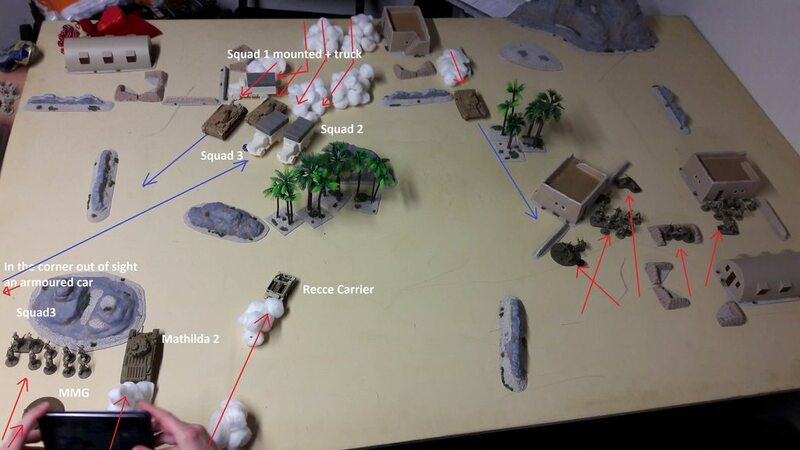 It is a fairly simple game for platoon/section sized battle set in WWII. 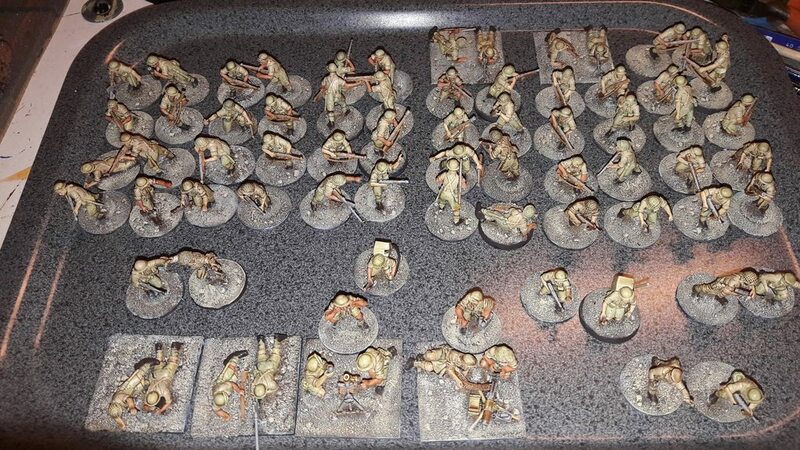 I started with two boxes of Perry 8th Army plastics because you can get the most troops out of one box. 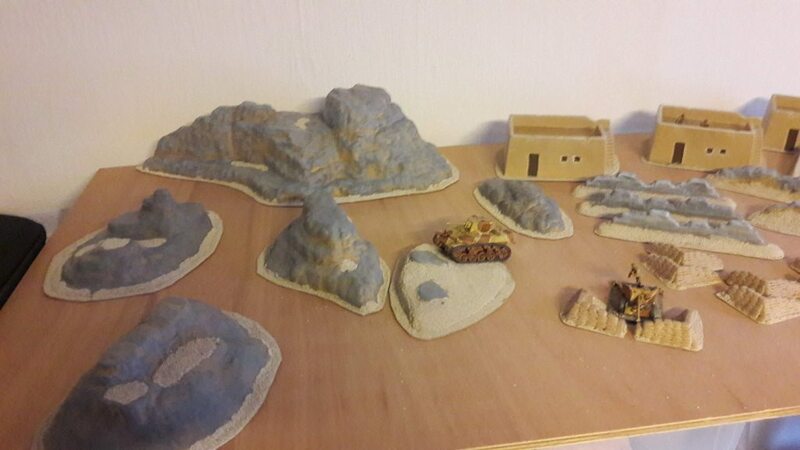 While building a couple of army lists I moved on buying Germans as well and after that went for some scenery. 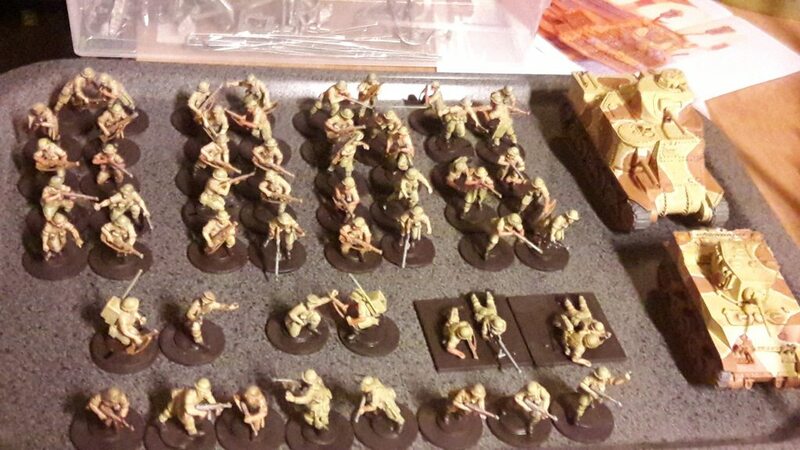 The Germans are all still in basecoat, the scenery and my 8th Army platoon show alot more progress. 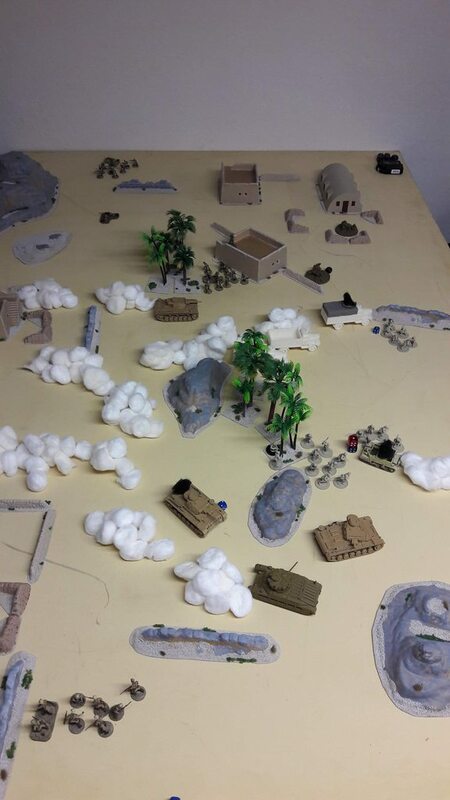 The second battle with my forces. 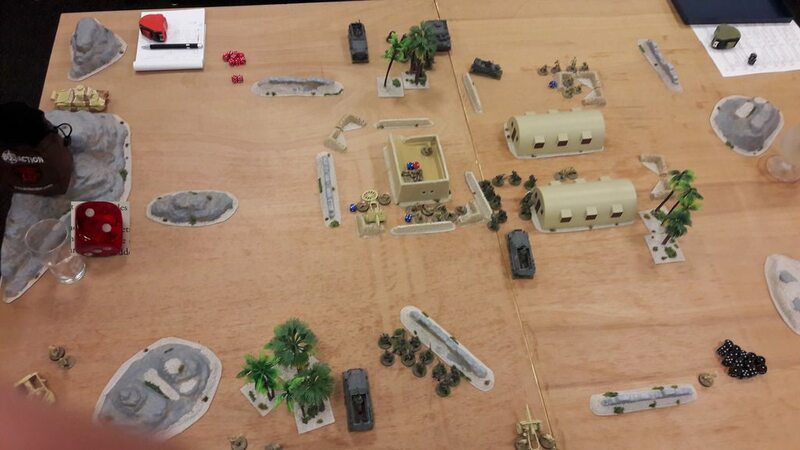 Rens played Afrika Korps and I played 8h Army. 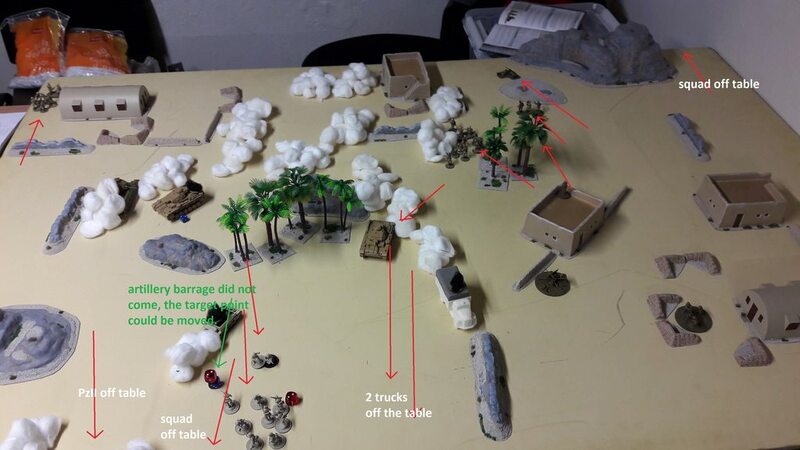 The first game I stormed in with my units and realized that bayonet charges in these days were terribly old fashioned. 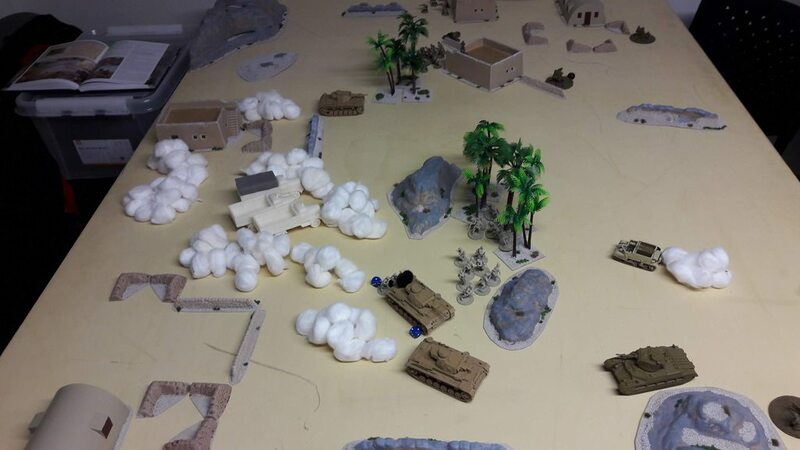 (And off course: veteran troops hit a lot harder than regular troops) The pictured here second game bogged down really early into a long range gun fight. No problem since both battles were for learning purposes and just good fun off course. 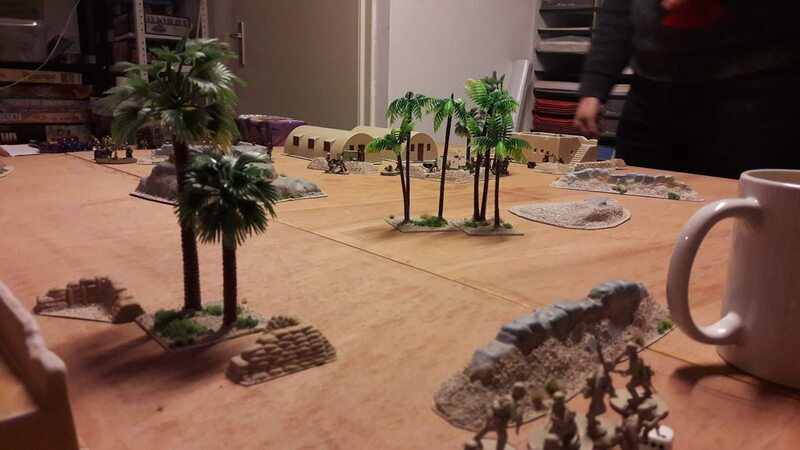 At the club in Nijmegen we don’t have that many desert terrain, the images of the above table show almost all we have, so I decided to make a desert table myself. 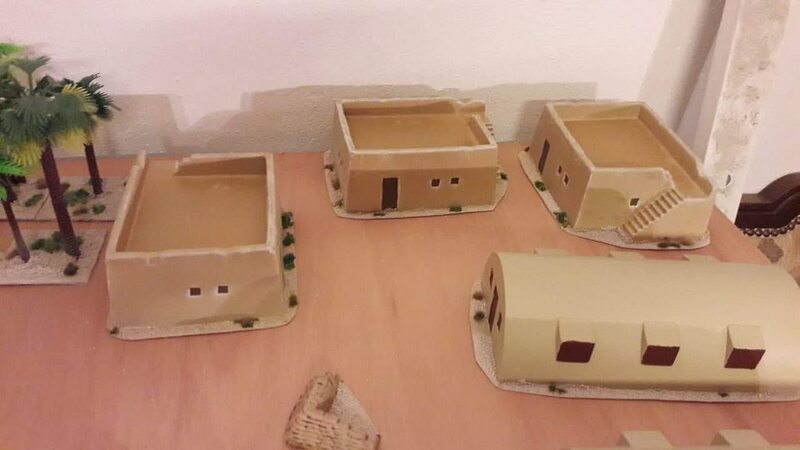 Bought prefab plastic moulded terrain from Amera Plastics in the UK and further the pictures tell the story quite well. And the table is set for the upcoming game next friday. 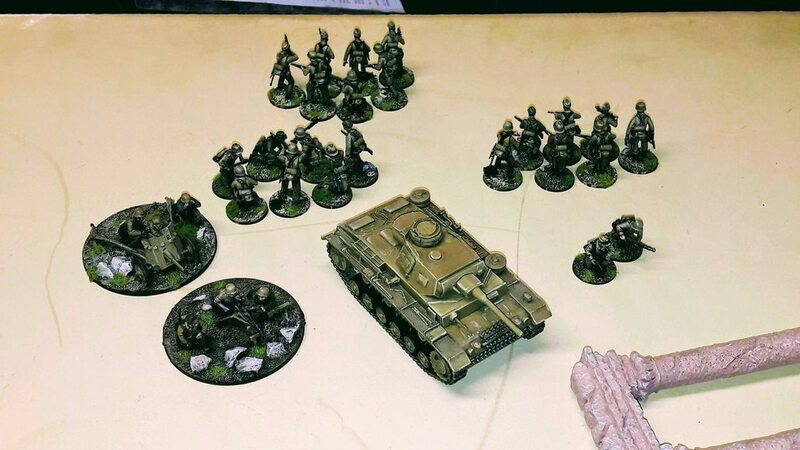 My fairly unpainted Germans against Guy and mine painted/semi painted Britons. 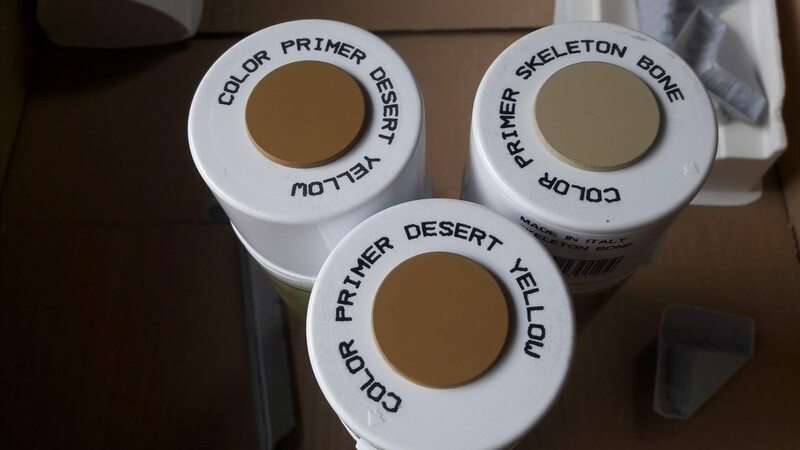 Desert cloth is added to my wishing list. The Lee/Grant and Stuart are very underrated tanks. I thought about getting some bolt action sets the other day in the hobby shop I visited but I had to save the money for other things. They are actually not underrated. M4 medium tank - Shermans - were called "tommykocher" (Englishman-Cooker) by Germans because they caught fire very easily. M3 medium tank -Lee/Grant - had the exact same problem, catching fire very easily. M3 medium tank had the cannon (75mm like the M4) in the hull. So going hull down with a M3 was impossible if you wanted to fire the main gun, so where the M4 was called "Tommykocher" the M3 was simply called "fine/great target" because the 88mm FLAK38 AA/AT guns had no trouble picking them of on the horizon. M4 had a crew of 5, the M3 had a crew of 7... the Russians called the M3 "a grave for 7 comrades". The M3 was the best the Western Allies had at the time and a 75mm gun is a great asset, because no German tank could match that gun at the moment the M3 arrived on the battlefield, but with the arrival of M4's the M3's were slowly fased out on the european theatre and rightfully so. Having said that.. the M3 is by far the most crazy/pretty/amazing looking tank in my opinion. 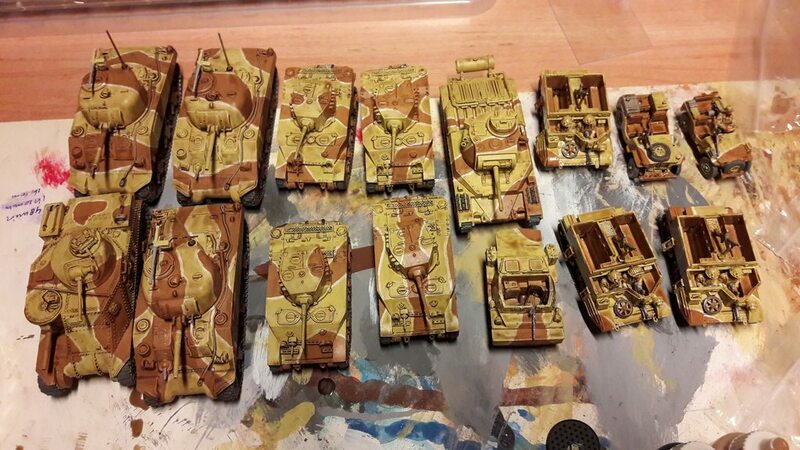 Which is the only reason to really buy a model, you like it, you paint it, you play it. In this account I agree with you the M3 Lee/Grant is underrated. 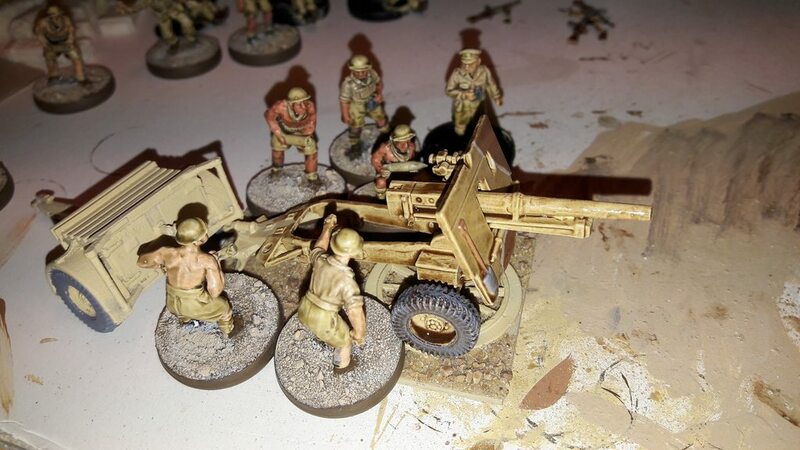 bolt action always had my attention but I started with a flames of war starter and never got further do to other bigger investments but it still looks great. 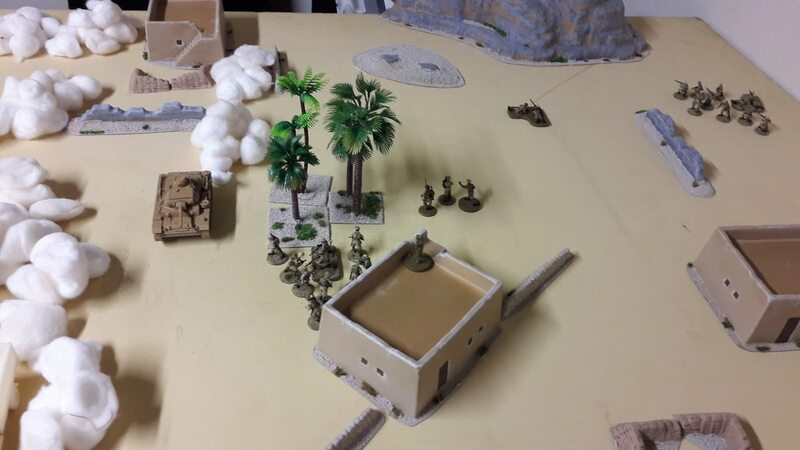 I have a big collection stilll (I think) of the airfix 1/32 scale soldiers and wondered if they could be adapted. 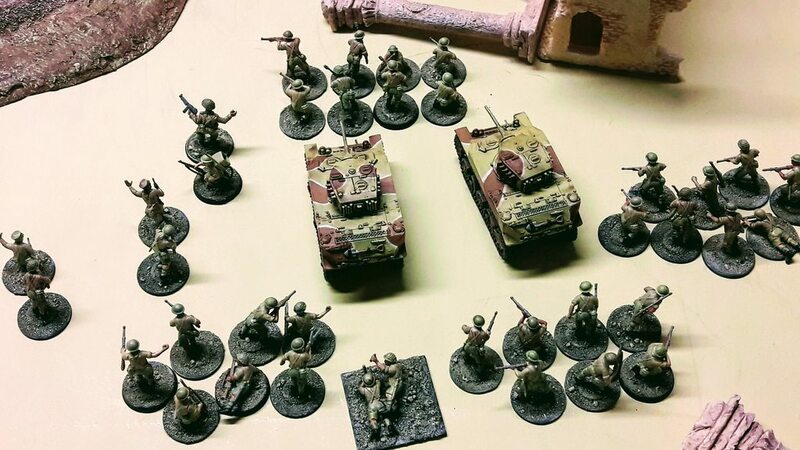 The North African campaign was always my favourite and at one time I think I new every allied/axis unit from 1940-1942 largely from the spi game CNA which had 4 maps, 200 pages of rules and 2000 counters. The unit breakdown on every division/regiment that even landed there plus the TOE for them all. Incredible game. Had it for 39 years and finally sold it last year for 3x what I had bought it for. Always had a soft spot for the Italians and their uphill battle with equipment and morale. 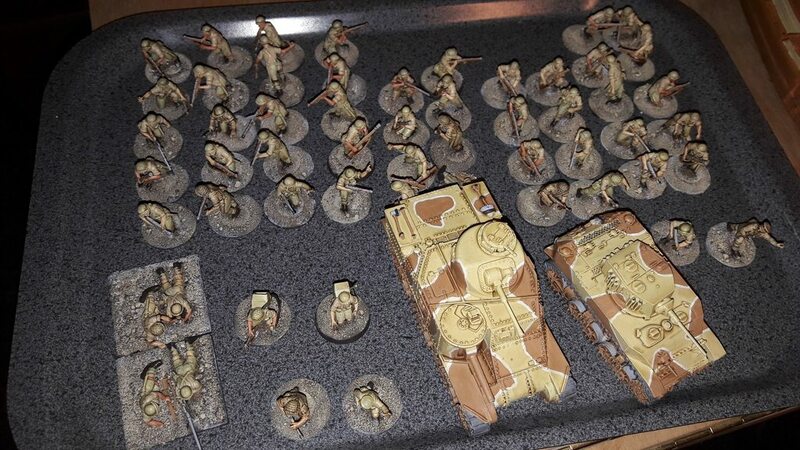 I do have a painted British Army,but for the start of the desert campaign (operation Sonneblume a.k.a. 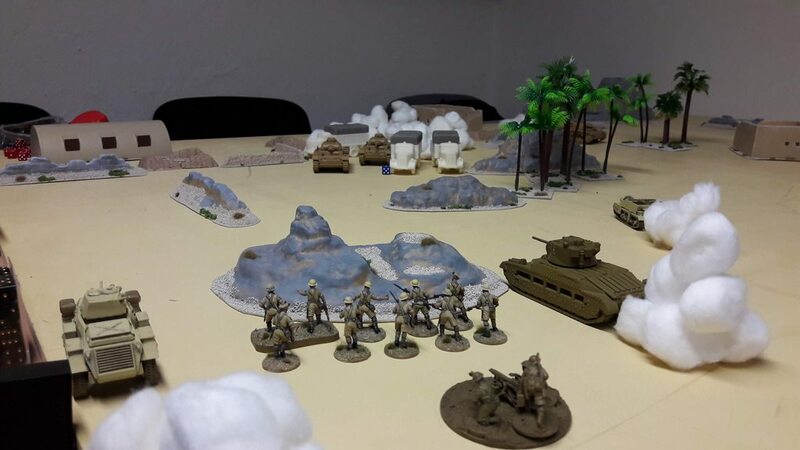 Rommel Arrives in Afrika) I have a british opponent. 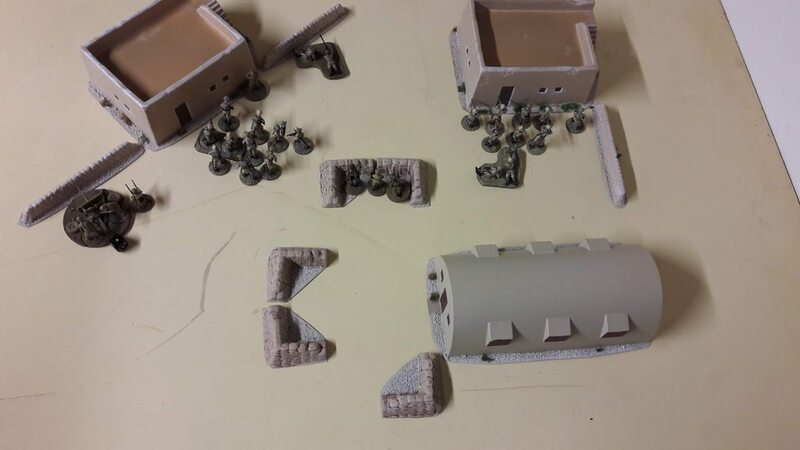 So here is my beginning, unpainted German Army. 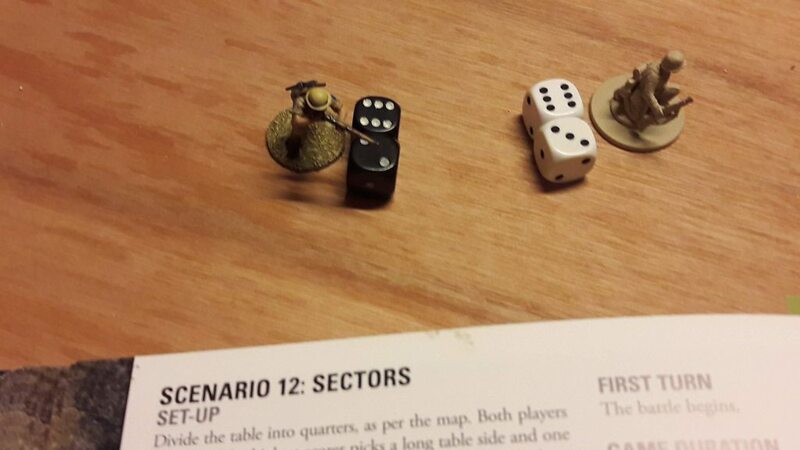 Scenario is sectors, both platoons have to destroy each other and gain as much ground as possible. 3 Sections, LMG en AT grenades. 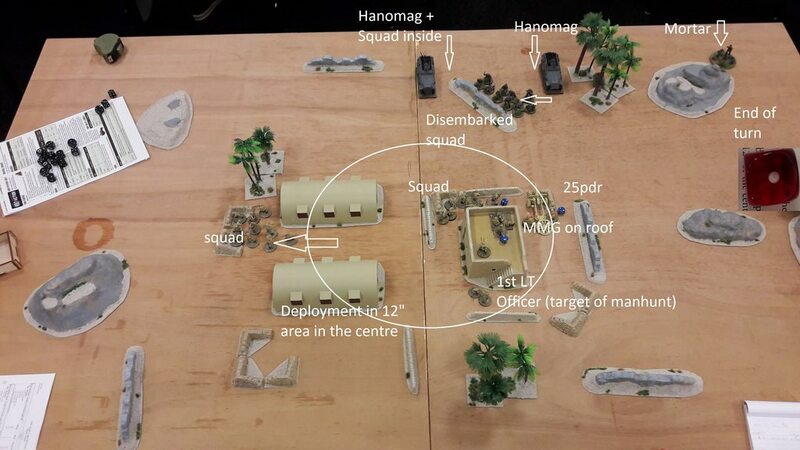 The scenario means that you set up on the opposite quarter sections of the battlefield. 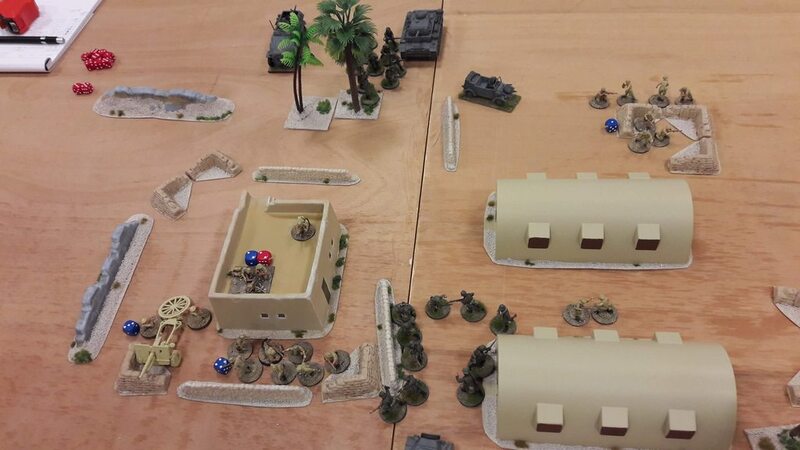 We both placed the tanks/armoured cars in reserve. 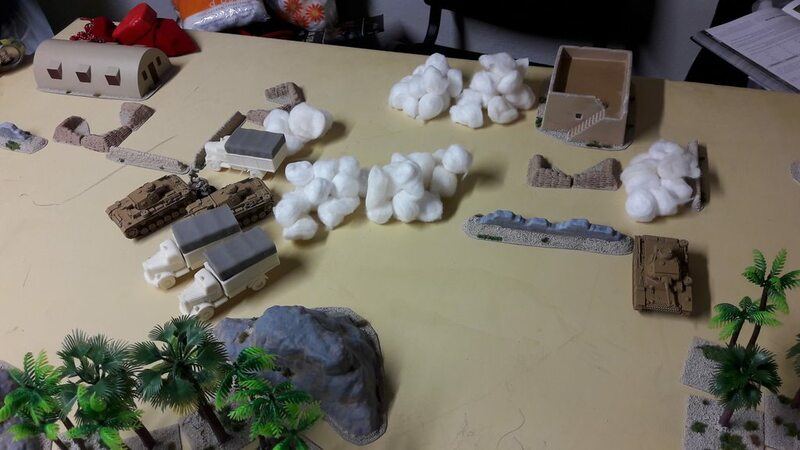 Letting the infantry and (self propelled)artillery fence the first few turns for them selfes. 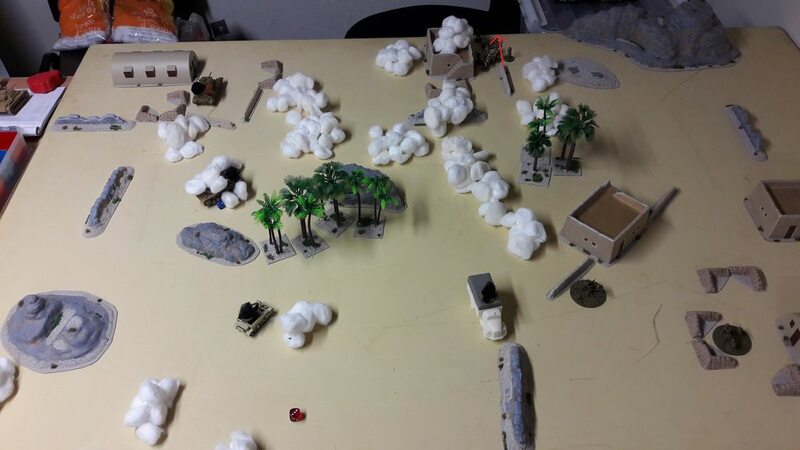 Initial bombardments before the battle meant that Guy’s free artillery observer (who had no assistant a.k.a. 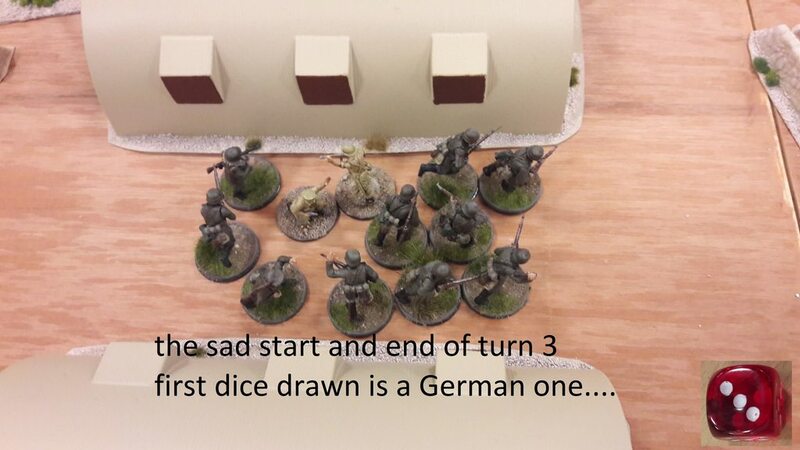 extra wound) died before he could cause any mayhem on my (german) side of the field. First turn gave me the opportunity to wipe a section of Guy and Guy took the chance to wipe my MMG. Second turn my reserves were not flanking and there for could drive onto the field, if I made my order tests, which I gloriously failed on all three tanks. 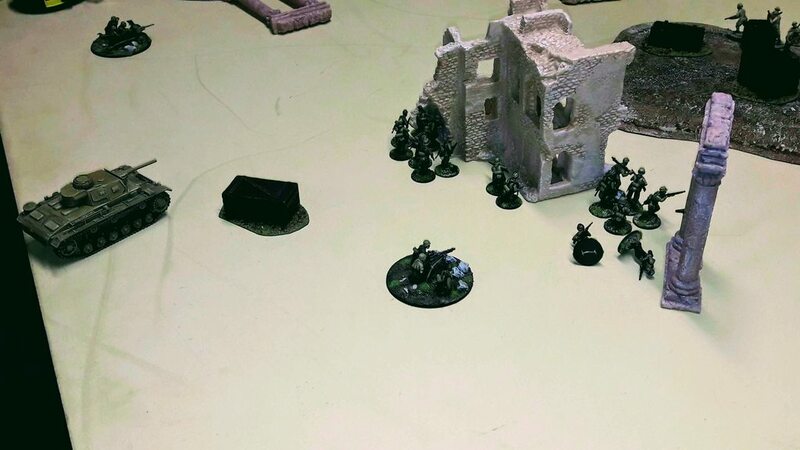 My infantry troops went hiding and Guy waited for his reinforcements as well. 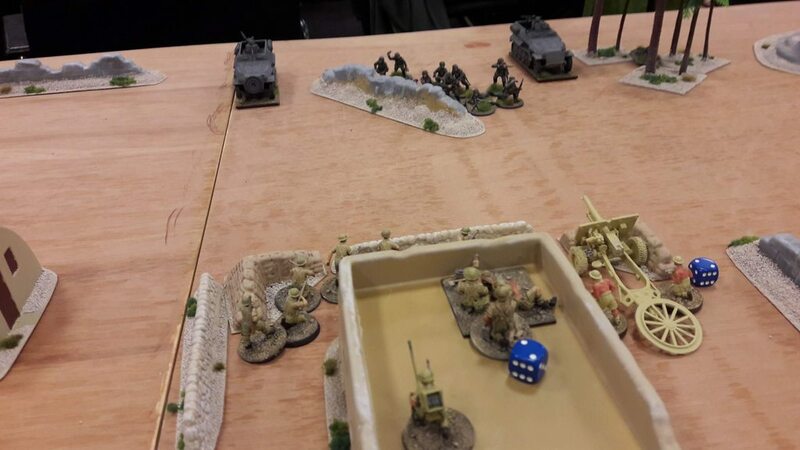 Turn three, my panzers arrive and they start supporting the Stug who is bravely trying to batter Guy’s forces on it’s own, Guy manages to get his Matilda on the field, but the Armoured Car is letting him down and stays in reserve. We play with the desert climate conditions and the arrival of the vehicles means that dust clouds (counts as smoke screen) are starting to form when cars drive over the field. 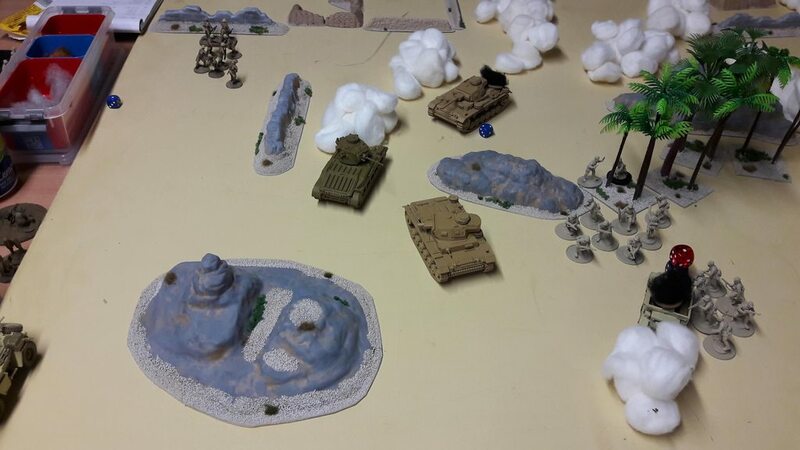 Turn four, both panzer III´s are advancing to take on the matilda who is returning fire, but all miss terribly. The british armoured car keeps up the good work and fails his order check again. 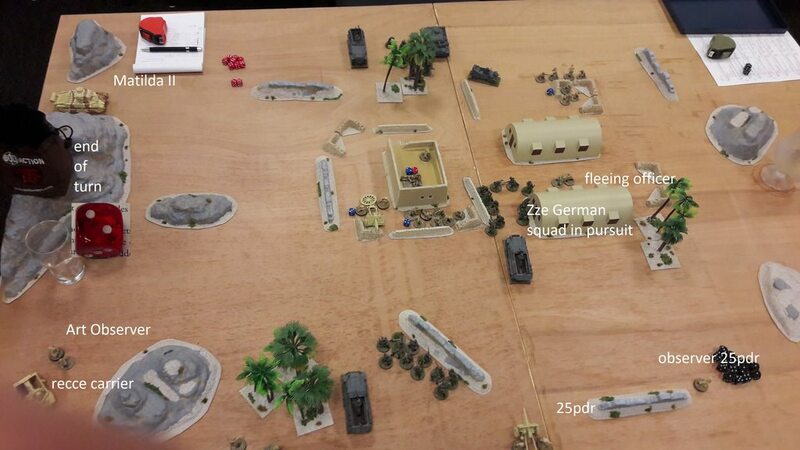 With the arrival of all my armour, the Stug and PZII advance as well shooting on the move. 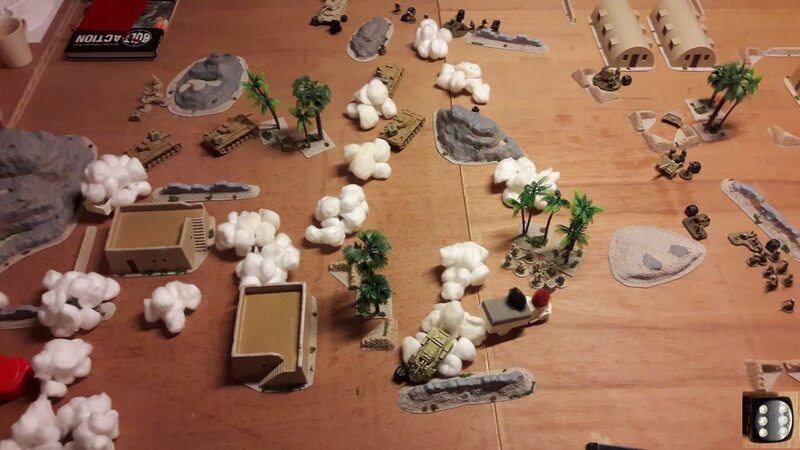 Turn five, First battle for all panzers III´s, they are nervous and miss just like the Matilda is missing as well. The panzerII and the Stug manage to do some damage on an infantry squad on the british right flank and on a MMG on the same flank. Eureka… Guy´s Armoured Car finally showed up and promptly started speeding across the field. 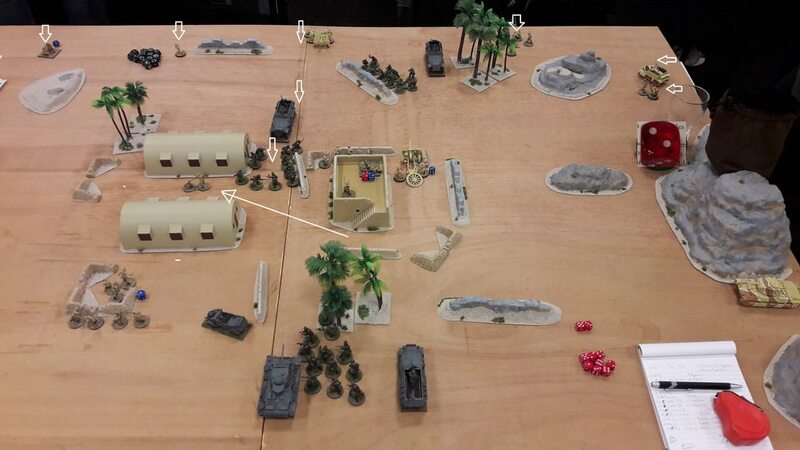 Turn six, the Matilda gets immobilised, my panzers, again, stay without a scratch on them, one of my trucks is shot to pieces by infantry. All troops available move into sectors that will give victory points to the player. In short a kill is a VP, unit in a neutral sector is a VP and a unit in the opponents sector is 3 VP. Guy 8 victory point and Henny 9 victory points. 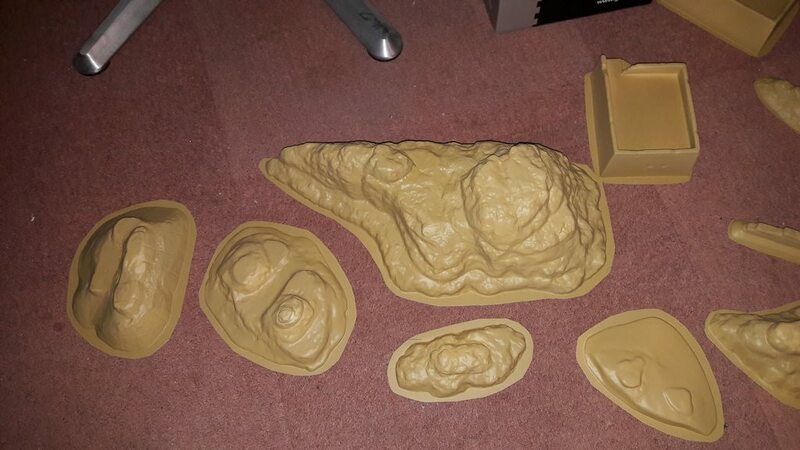 conclusion 1, desert with to much terrain does not feel as desert. 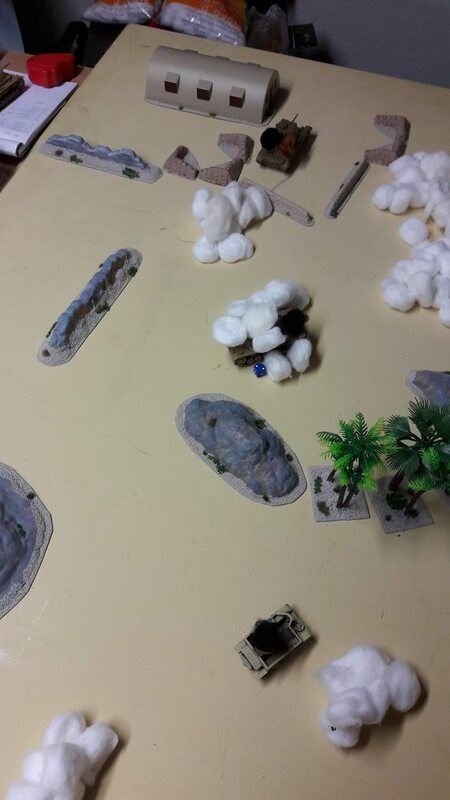 conclusion 2, 3 bags of cottonwool makes you laugh silly, but when bag number two is almost empty at turn 5 it actually seems like the right amount for a dusty desert game. 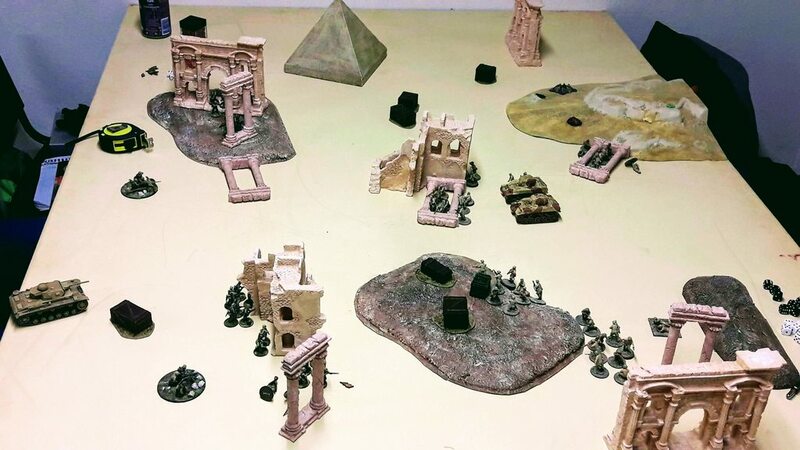 conclusion 3, objectives are giving a complete different feeling of the game instead of just bashing the opponent you have to make a cunning plan. 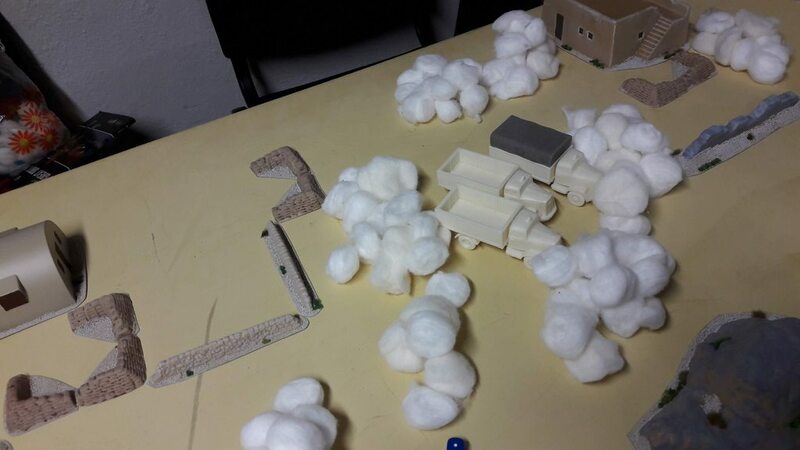 Cotton is great for making smoke clouds from. Looking great! 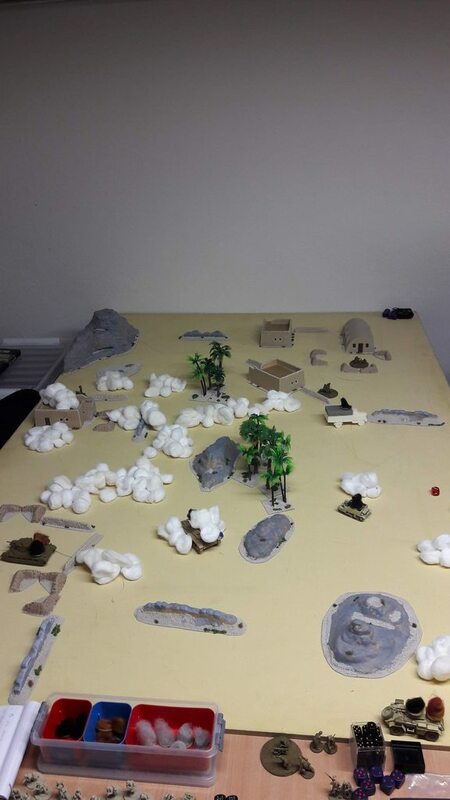 The terrain is wonderful, and neat to see the desert action. 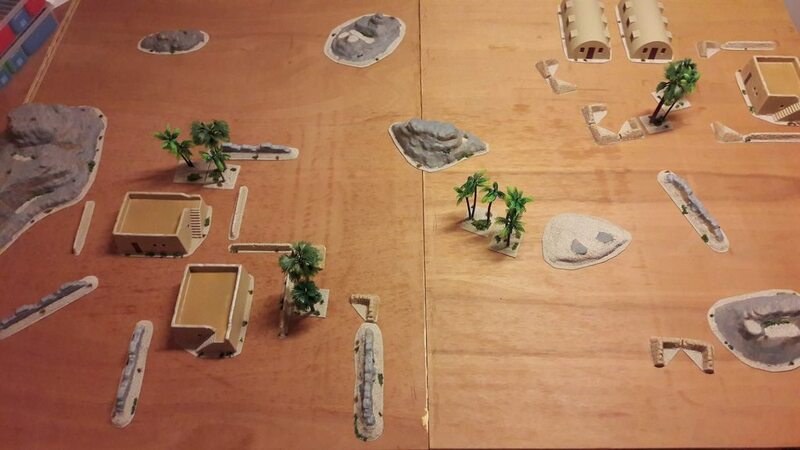 I've always liked desert tables and with the right mat yours would look fantastic. Well even more so than it does already. 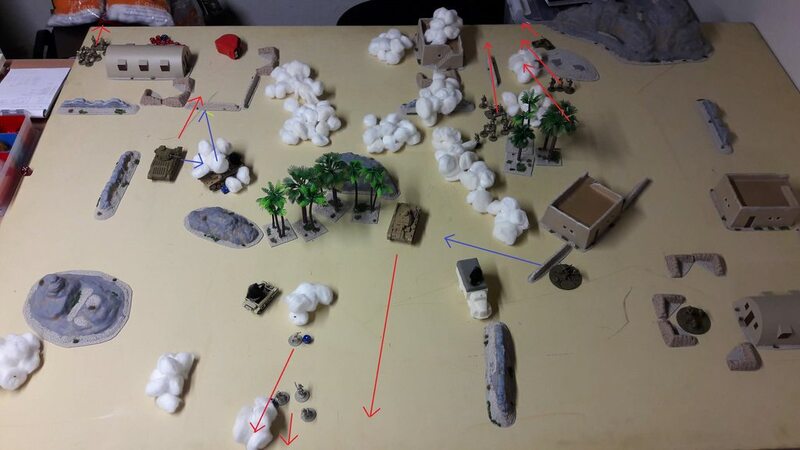 As for Bolt Action, how does it compare to 40k and how are turns organized? I don't play 40K sorry. no comparison. 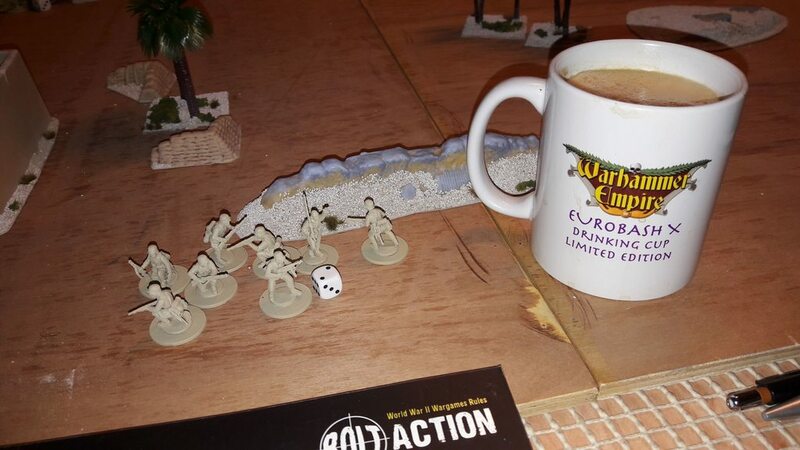 As for turns Bolt Action has a die per unit. 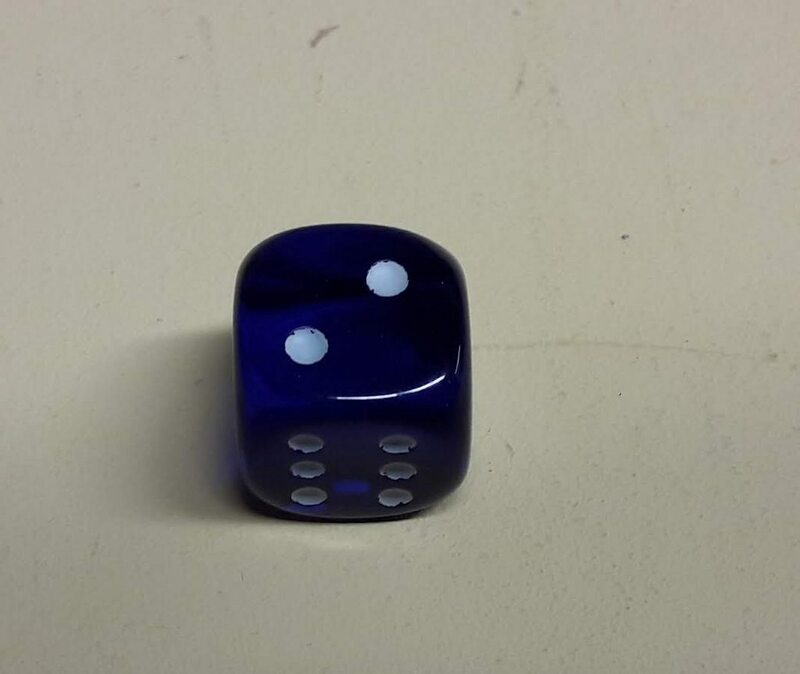 All dice go into one bag, yours and the opponents. 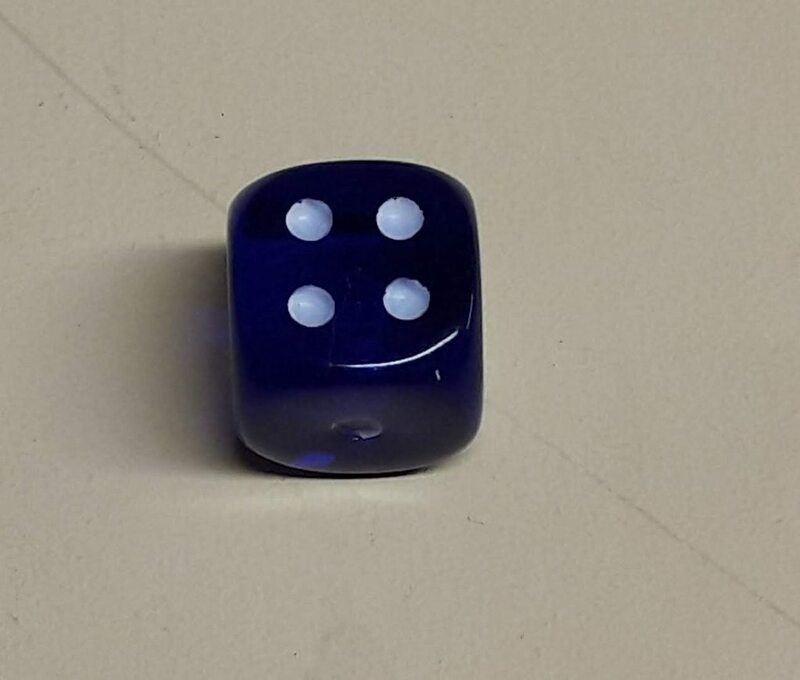 you take dice to see who can activate a unit. so IgoUgo per unit not per turn. youre constantly busy and involved on any action that is going on. Quite original is that an officer can activate additional units within 6 or 12 inches (depending on the officers rank). 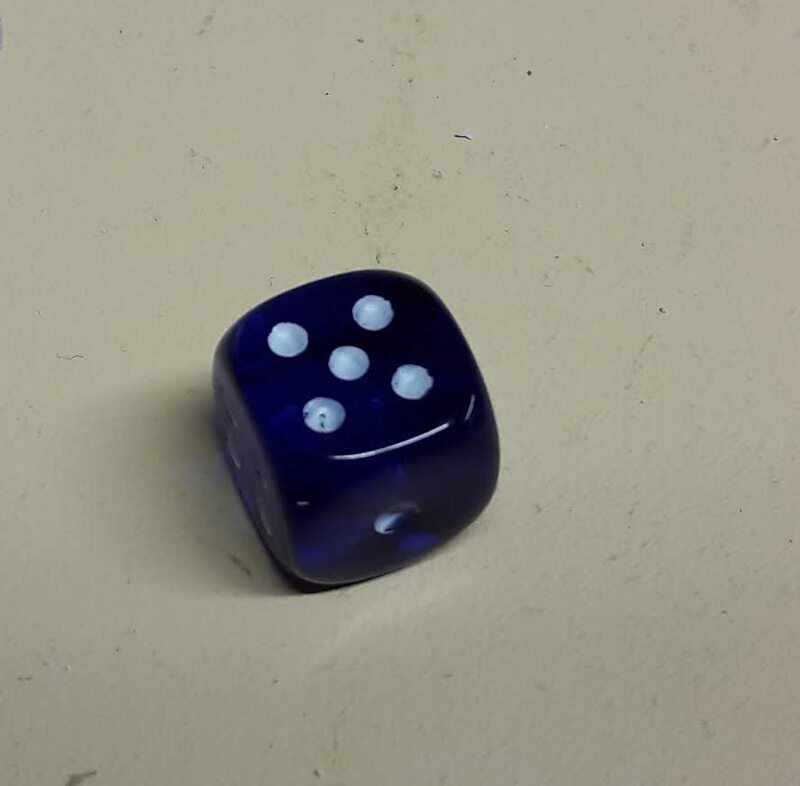 so if you allocate the die to an officer the officer can claim dice up to his rank extra from the bag and these dice can be allocated to units in the command bubble of the officer. The officer therefor creates a small Igo for a coordinated attack. Further I presume it is alot like 40K, a lot of dakka dakka, but really down to earth kind of way. Ow before I forget, it is a skirmish game, the tank driving mechanics don't feel not very "realistic". (I am really carefull with this word in science fantasy, but this game claims not no be science fantasy, so) I don't know yet what is bothering me on this subject but I am going to find out and probably tweak the game a bit. That sounds closer to the Lord of the Rings game than 40k, I like it. Skirmish suits me better overall I think. And I wouldn't know the first thing about realistic tank movement, all that matters is that it feels right for the game. Looking forward to more reports. Now that you mention it, it does...sort of. Where the officer in Bolt Action is a coordinator who stears troops in there role to perform better as a group though, the character in LotR is using his ability to force (heroicly) a breakthrough in concert with a couple of other soldiers. They probably, game wise, produce the same thing/momentum, but the leading from the front off a LotR character has a whole different feel to it. 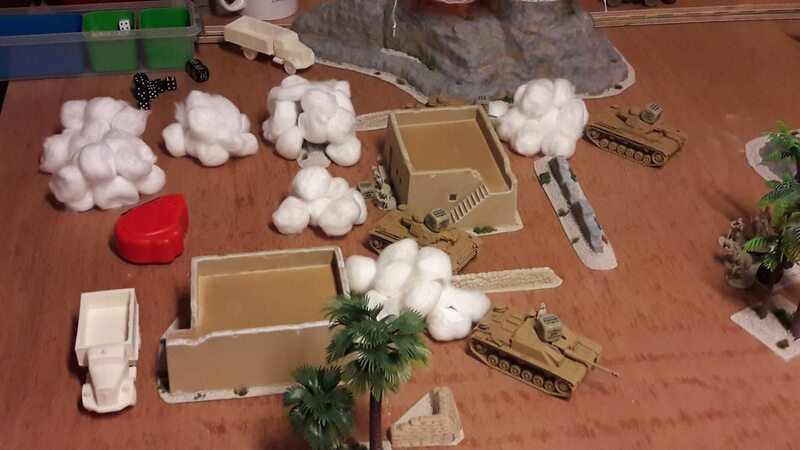 then the officer who is activating a group of tanks and the shirks away to avoid damage. 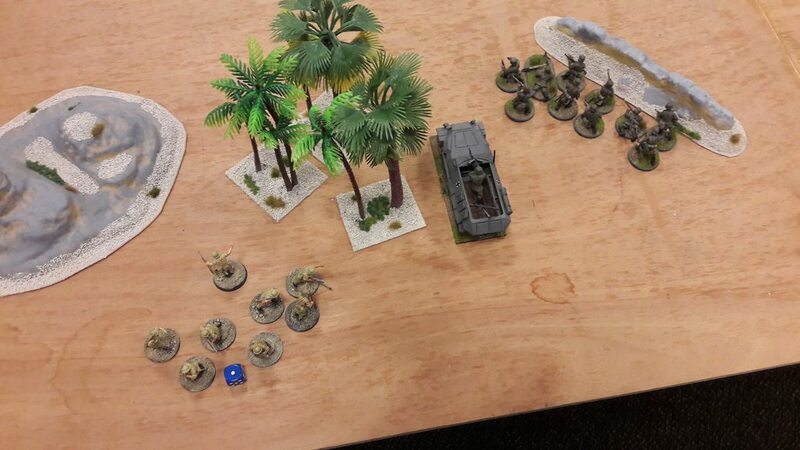 Then the troops, LotR has shooty and close combat, while in Bolt Action (sofar) I avoided it like the pest. First game I tried it and there (apparently) is a reason that bayonet charges are very rare on a modern battlefield. 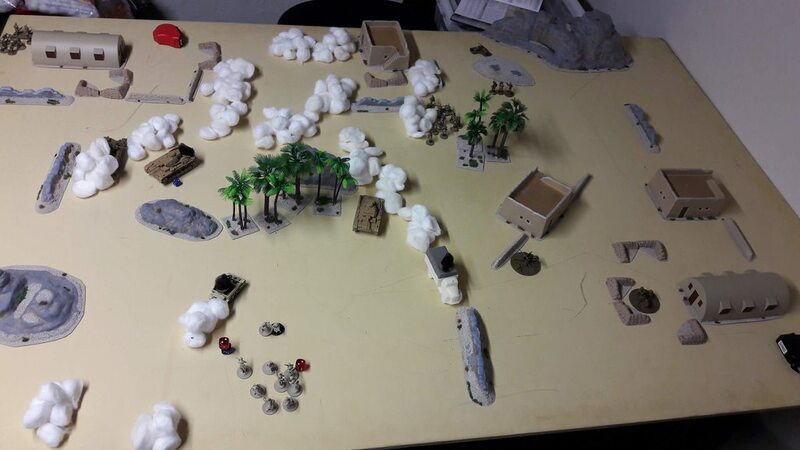 The German commander may go first in turn 2 and move a unit on the long table edge opposing his first wave of troops, thereby starting with surrounding my forces and placing his forces just 10”away from my officer. 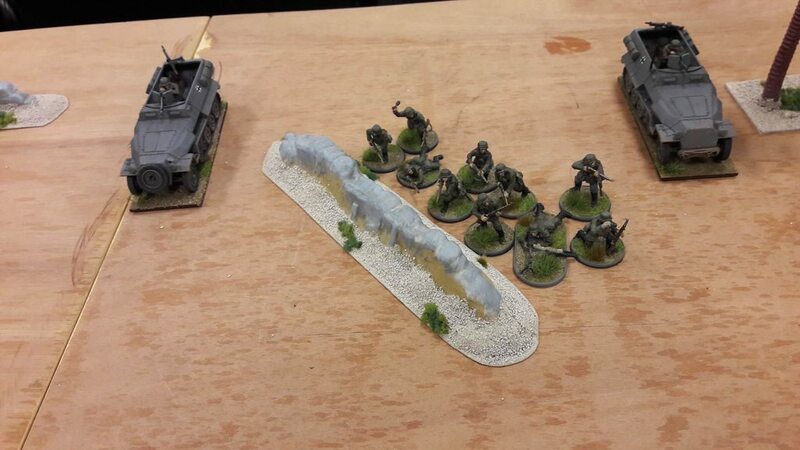 Still not aware I move my troops up the short table edge and the Germans starting table edge cautiously to avoid immediate contact with the enemy. 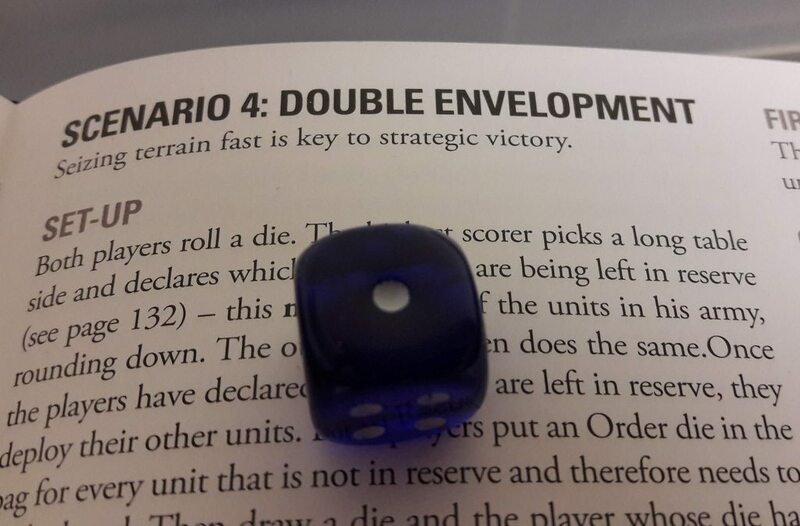 Halway turn 2, a really ideal moment to read the scenario… like really good. The officer has to be taken out of action in close combat (a.k.a. captured) and wait a minute. 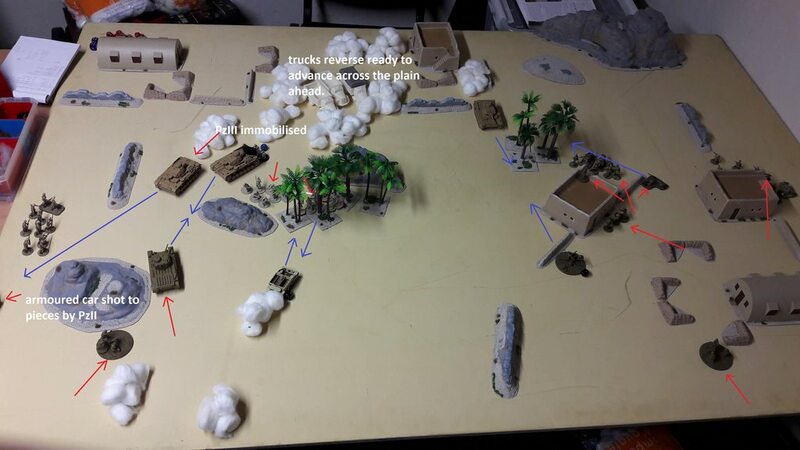 My forces are where my officer is not and to get to him and protect him… I have to go through the German forces…. 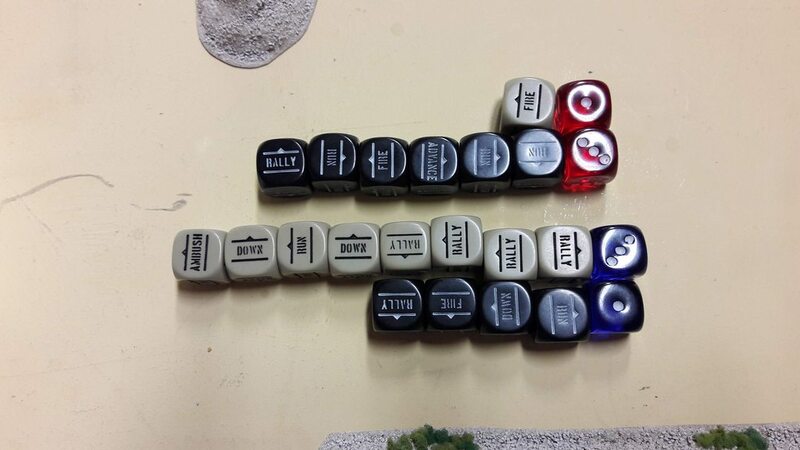 Now it is time to panic..
My office and a German squad stand 4 inches away from each other and the desicion (in turn 3) comes from the die that pull first… it is a German one. 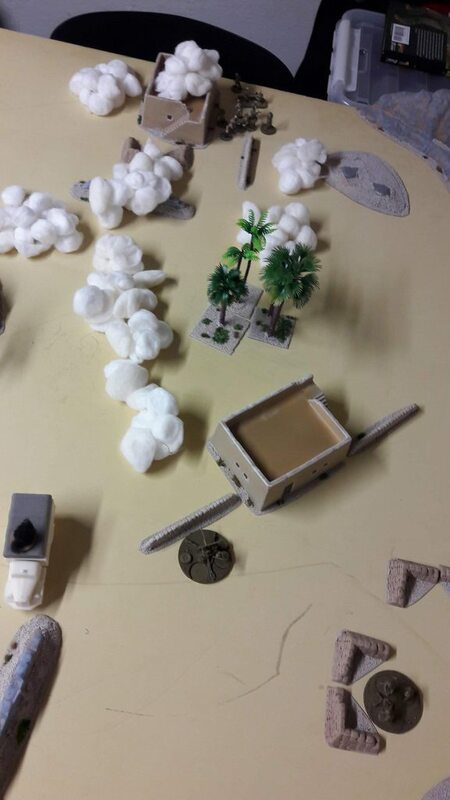 Officer down, German Victory. The most silly way, by far, how I lost a game. Thanks to my opponent for a very nice game. 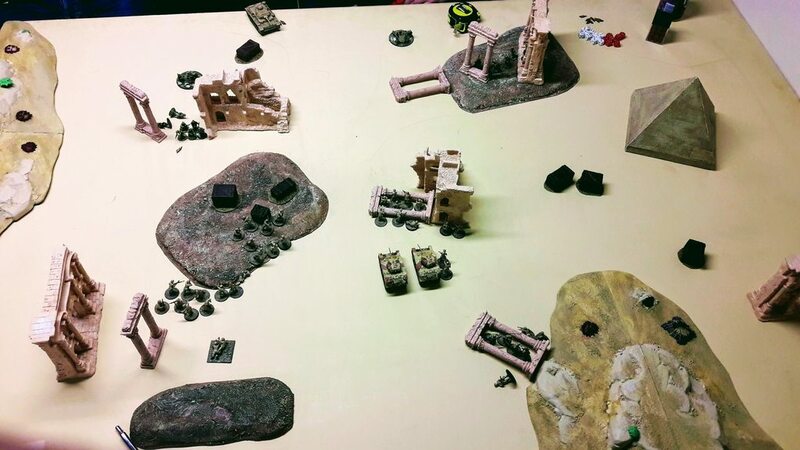 We played turn 3 and 4 to an end and the misery for the Brits only got worse and worse. I have learned a lot from this battle, that’s the real positive side of it and a real fun game to play. Up to the next. 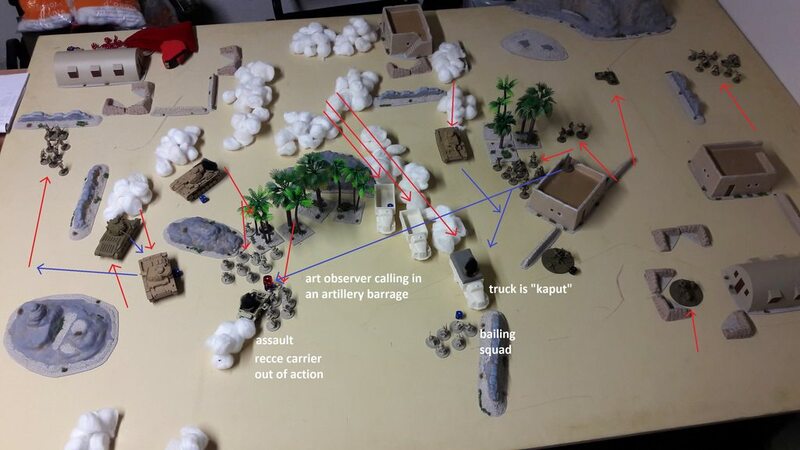 For rules, I would give a go to Chain of Command. 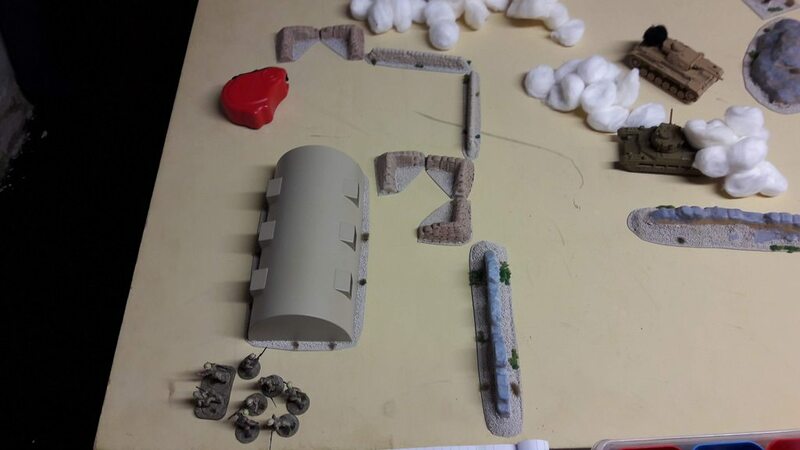 3 Februari I am going to test play those rules on Poldercon. This sounds interesting, are regular viewers welcomed as well or is it really an event to go play at? As viewer you are welcome I guess otherwise it would be really difficult to get a taste of it. Poldercon is in the Netherlands? I enjoyed seeing the picture of the veteran Unions and Confeds shaking hands. PolderCon Hi Henny, bezoekers zijn welkom na de lunch, dus na 14u en hun toegang is gratis. De nadruk ligt bij PolderCon op meespelen en het kletsen met oude bekenden die je niet zo vaak ziet, maar we gunnen belangstellenden wel een kijkje in de keuken. Hopelijk komen ze dan de volgende keer de hele dag. Dus als je op het forum nog niet had gezegd dat mensen zich nog kunnen inschrijven voor de hele dag, dan mag dat van ons er bij in je antwoord. Poldercon is in the Netherlands. It is always enjoyable to shake hands when casus belli is over. I see, thanks for the information Henerius. I might swing by in the afternoon then, which suits me better as I'm playing a 4000 point game per side 2v2 the night before. 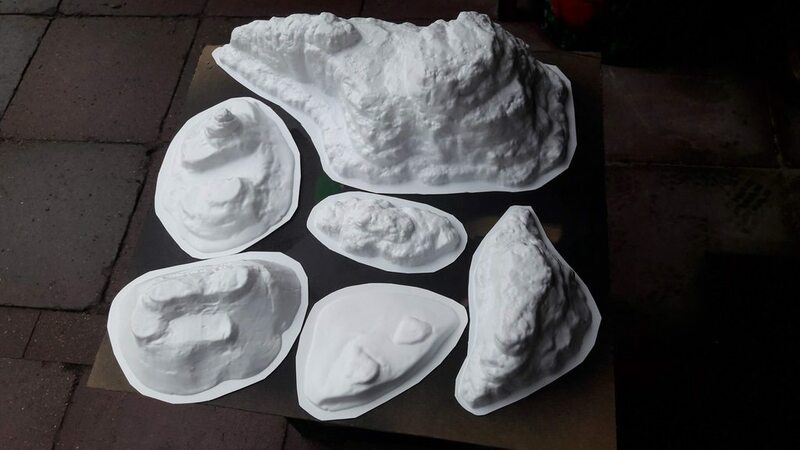 Just an update on the painting department. 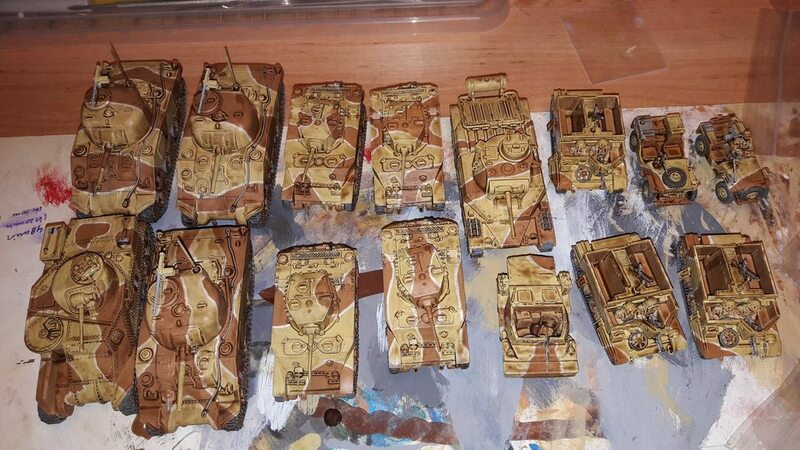 Progress on the British forces. 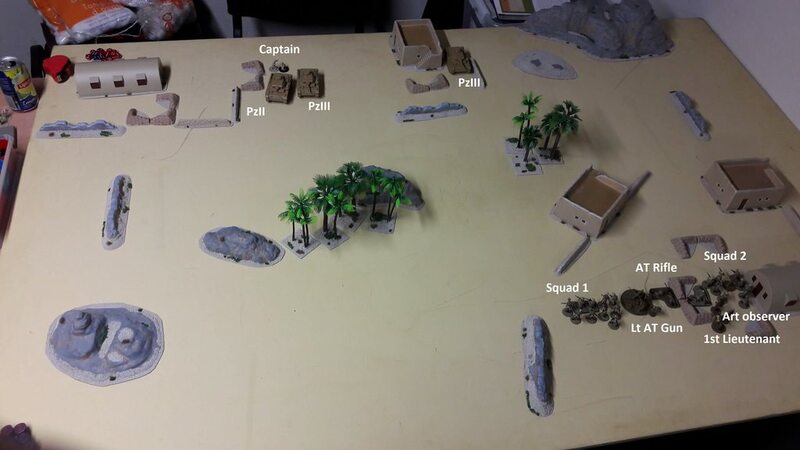 I want to play early and mid war Desert Campaign. Which is divided in a couple of lists. Armoured division 1940/41 and Armoured division 1942, Infantry brigade 1940/42, and the lists that stand in the army book of the British which is early war 1940/41 and also a list for 1942 desert campaign. 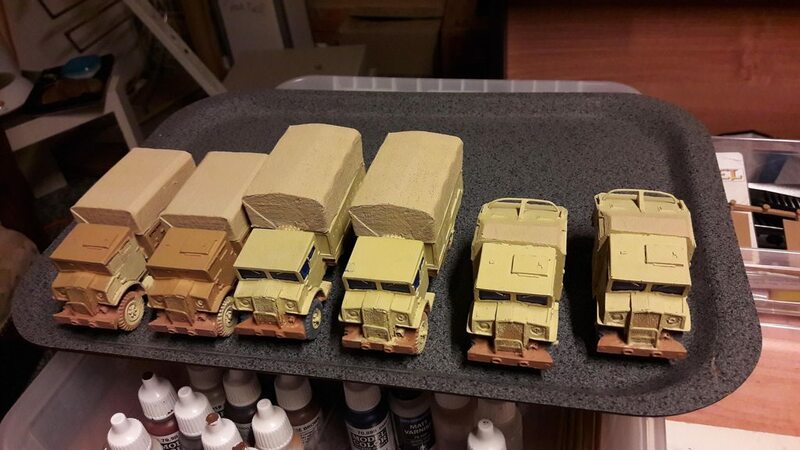 When the lower vehicles are painted I can play the British 8th Army over this 3 year period. Almost done now. 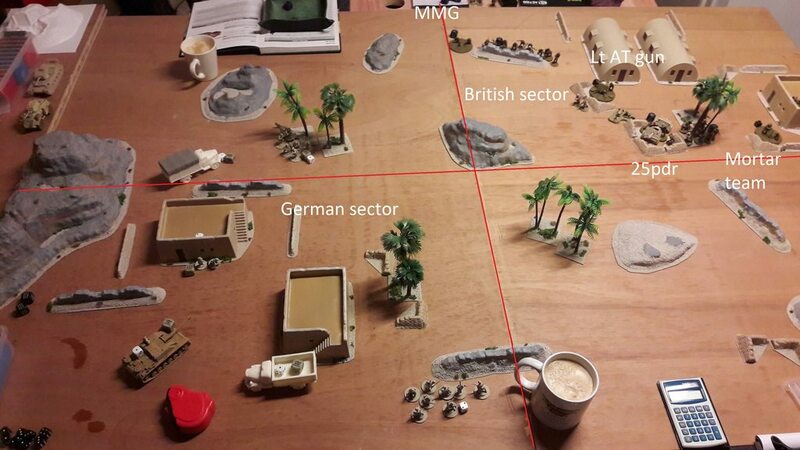 After this the plan is Deutsche Afrika Korps but I am certain that I will be distracted soon enough to another project or two. 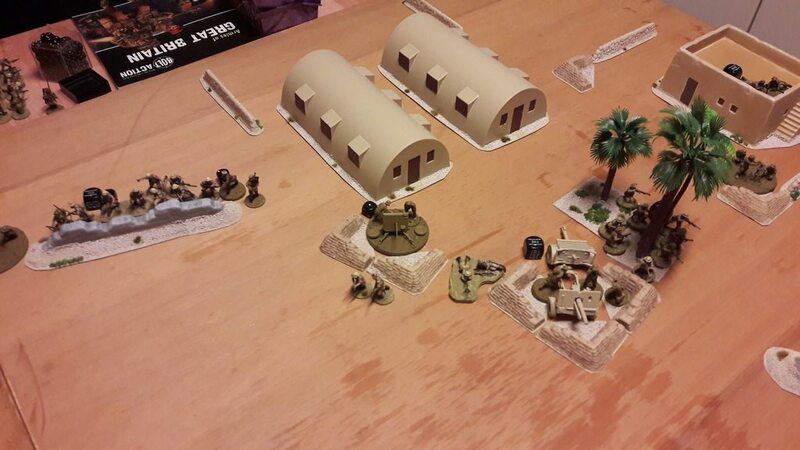 Double envelopment means both armies have to aim for the other side. 2 victory points for a unit in the enemy end zone. 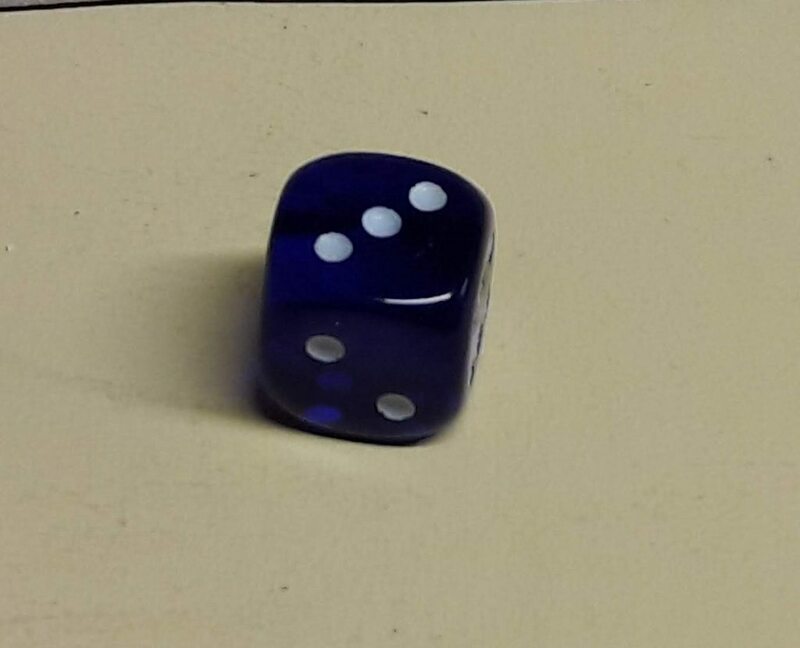 3 victory points for a unit that leaves the opposite table edge. 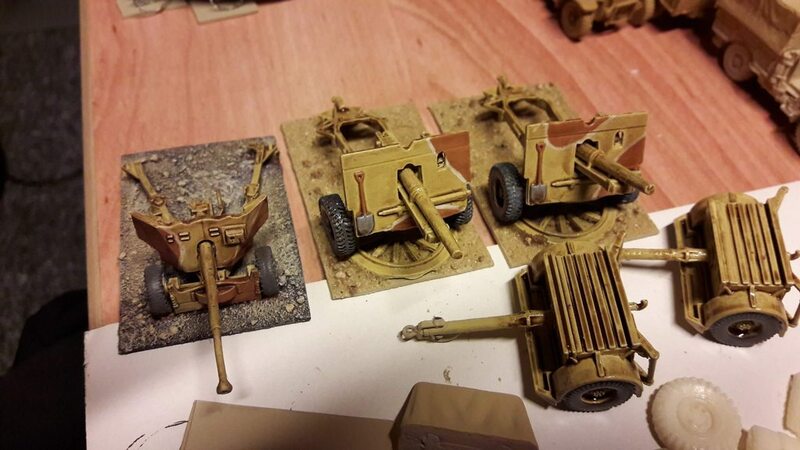 Since the DAK have the Afrika Korps Panzer Division as army list it means everybody needs a transport. I have 3 squads of 7 or 8 men which each need a truck and the commander can fit into one of the trucks. 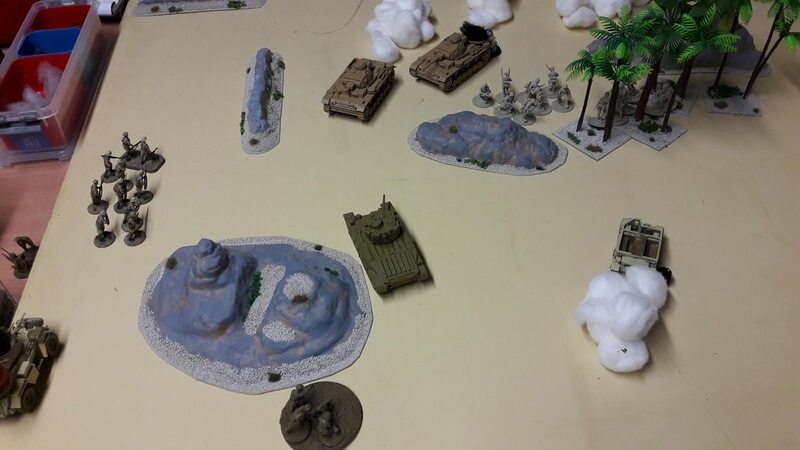 I deploy my officer and the command tank on the table. 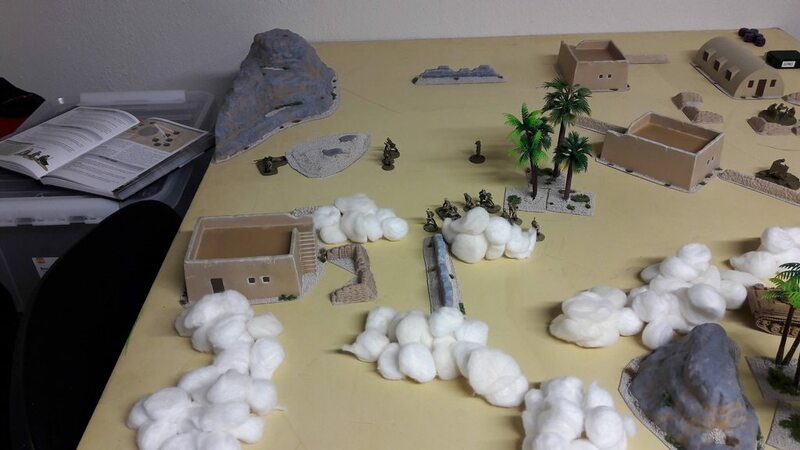 Guy is setting up on his left flank with most buildings. 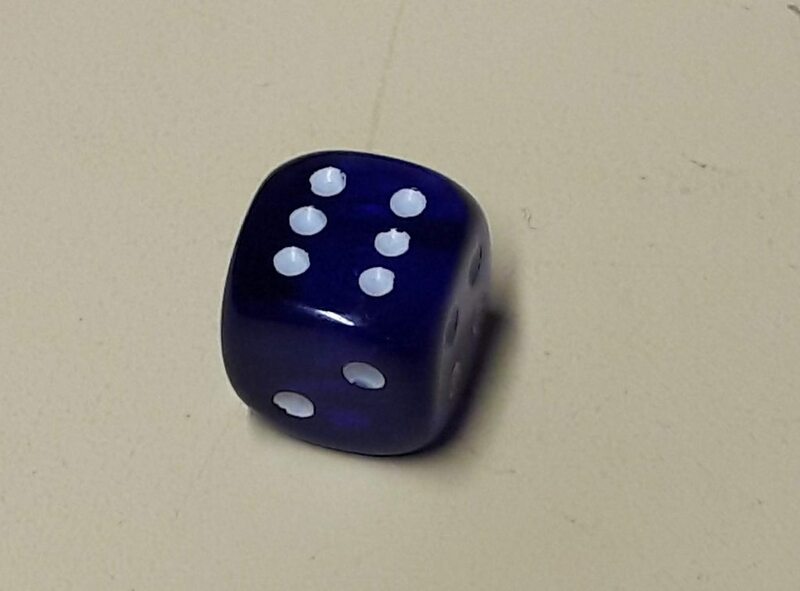 I place a PzIII on my centre left to form a thread to any infantry to eager to advance. The plan is deter the infantry and get to the other side asap with my army on one flank only or maybe in the centre with as many as possible units. After all that´s the objective gathering victory points. 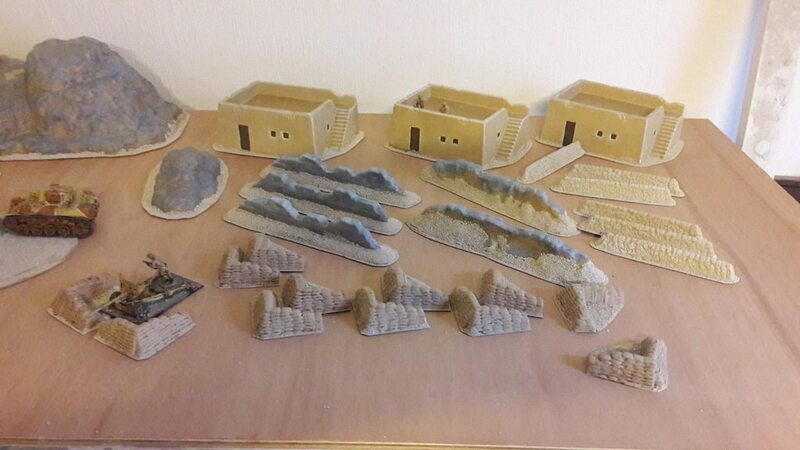 All my units arrive neatly and, being in a desert environment, the dust is flying around. Every truck that shows up makes for a great pile of dust cover, nice. 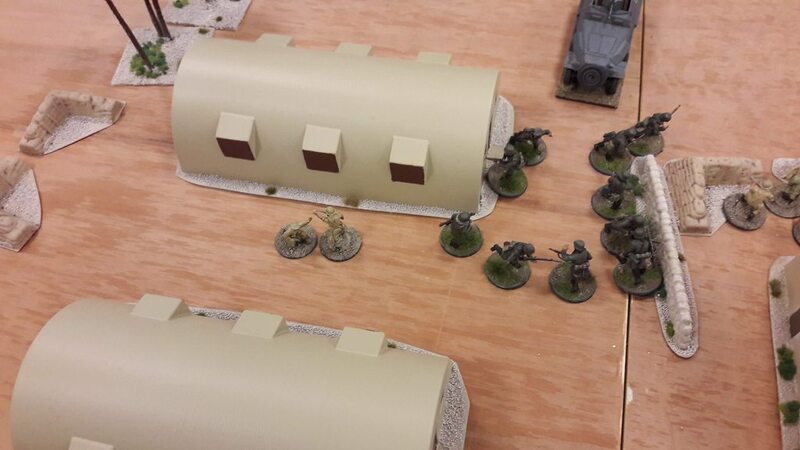 Guy arrives on his left flank with several units of him. 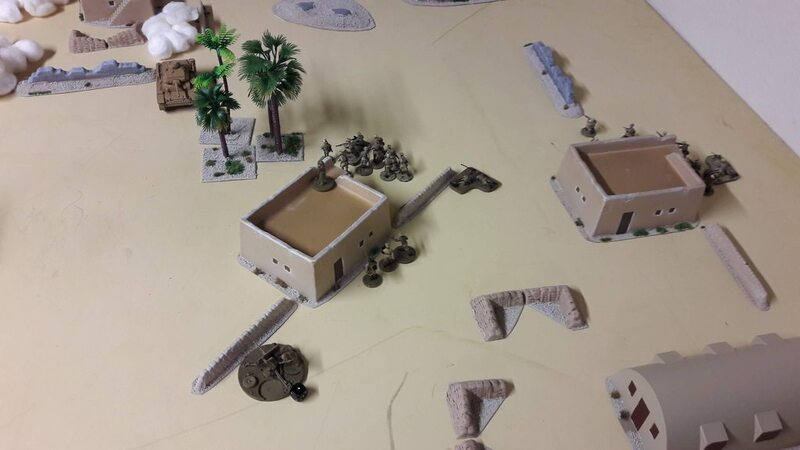 The Mathilda, the armoured car and the recce carrier al being a thread to my plans so they have to go or be ignored and run past. 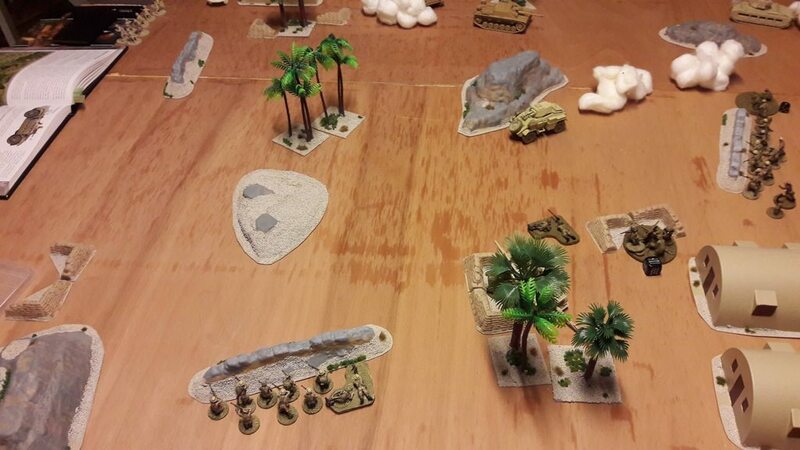 My PzIII in the centre is harassing the moved up Lt AT gun in Guys centre, ignoring the rest, the tank being there is enough for the infantry to move cautious. 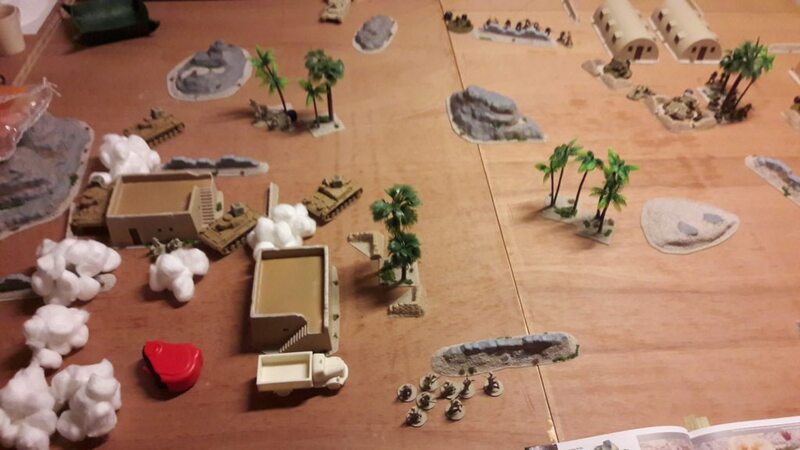 The fighting really starts, my PzIII on my right is being immobilised by the Mathilda, My PzII command tank gets the armoured car out of action. 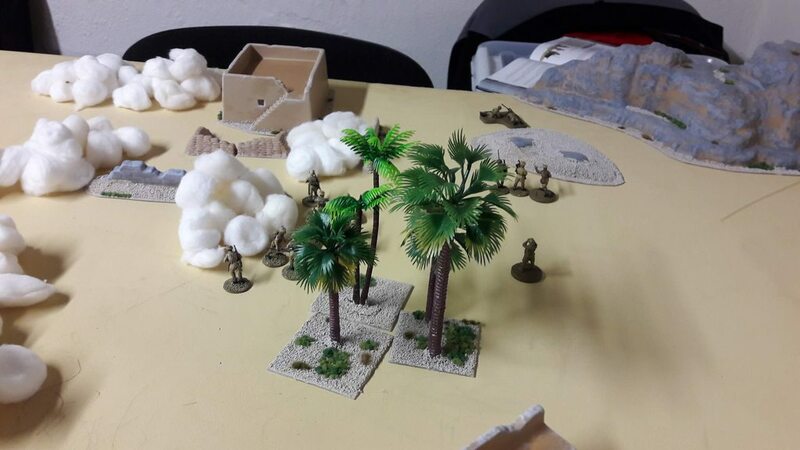 Two of my squads disembark and move up the board to a tree line. The trucks reverse and make ready for a dash over the empty wastes of the desert. 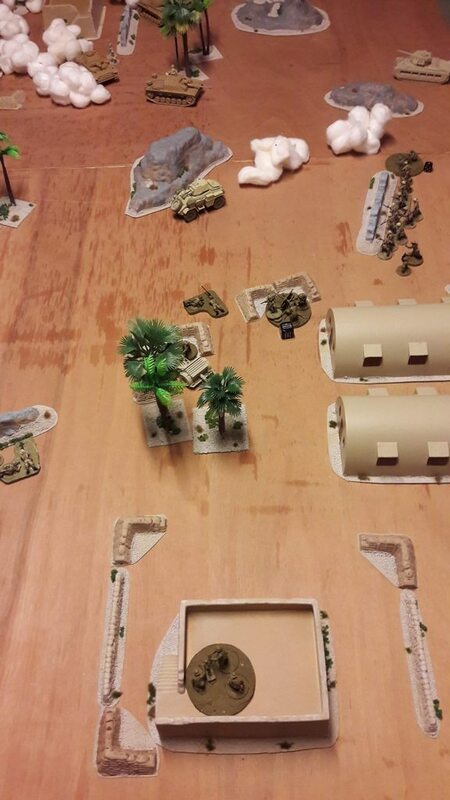 Guy´s Recce Carrier get´s pinned by an infantry squad and gets a down dice without having moved. 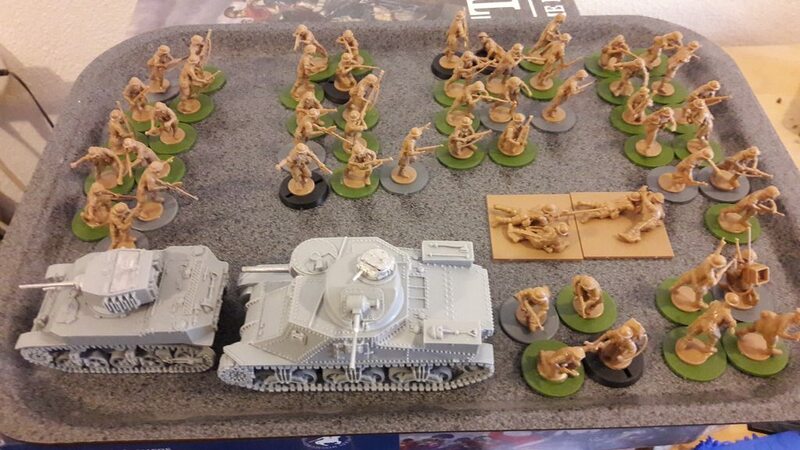 My commander tries to keep amongst the biggest group of units to steer them into action. Guy´s forces on my denied left move up, but his commander standing there is activating units that are not involved in the fighting. A gust of wind blows the dust clouds 5 inches over the field (first time I see this happen). 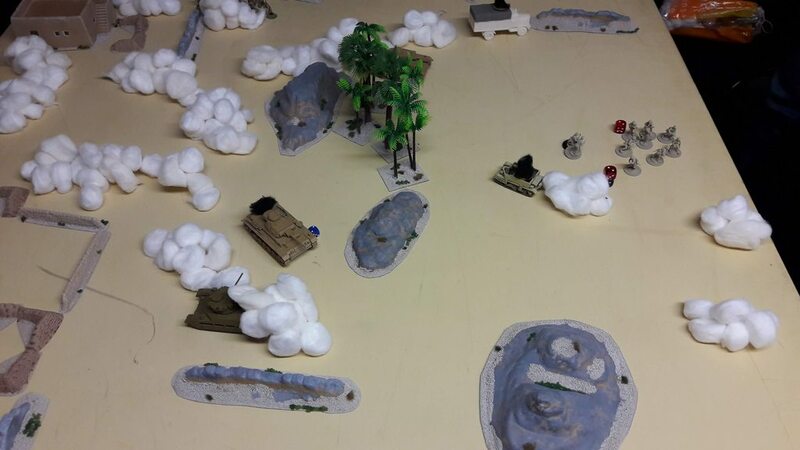 The Artillery barrage lands on two infantry units. 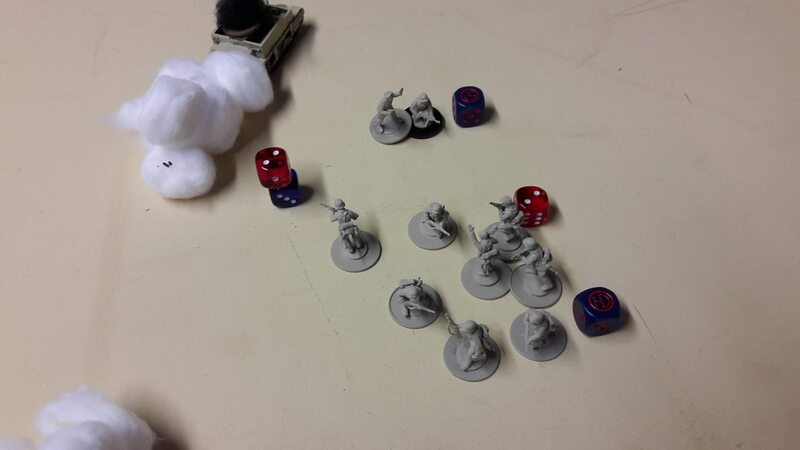 My captain loses his sidekick and the infantry unit gets decimated receiving a whopping 6 pinmarkers in the process, while the captain only gets one pinmarker. Most importantly, my immobilised PzIII is getting of one shot in the rear of the running Mathilda which destroys the Mathilda. My units are already off the board, or stranded immobilised. Guy moves the last forces of the board. We don’t roll off to see if turn 7 will happen. 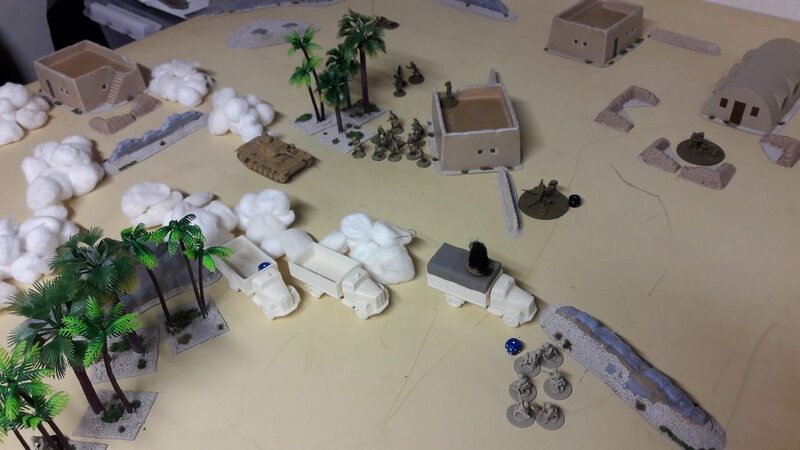 We leave a dust and vehicle wrecks covered battlefield. Counting the victory point gives a clear Axis victory. It was a good and enjoyable game, thanks Guy! Looks like fun being had! 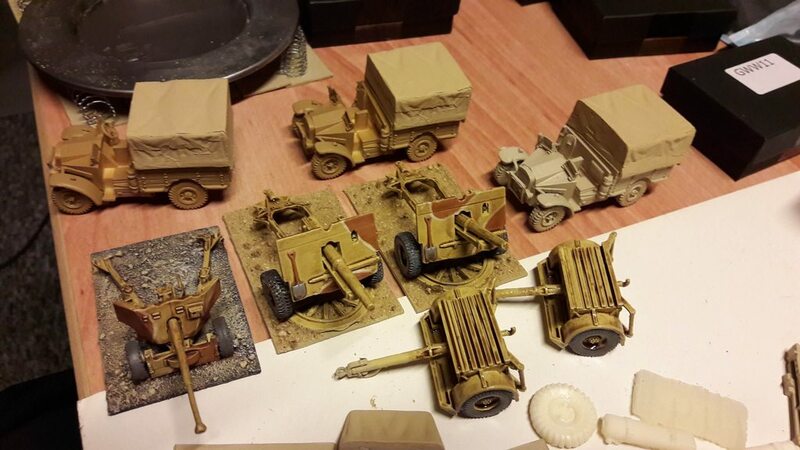 By the way, just seeing all those painted British models, and they look very good! Any particular commonwealth unit? Same for dak.